Please bring an outdoor tree decoration and a plate of Christmas food to share. The next gardening on the green is this Saturday, 10th November 10am-12pm. People of all ages welcome, the more the merrier, including little ones. As a reminder to those villagers who were here at the time and to let those of you who have come to the village since 2000, this is how the Green came to be created and maintained. A group of villagers came together in 1996 to plan how Kilndown would celebrate the Millennium. They identified that the redundant school playing field could be developed as a Green that could be used by all with play equipment for the children along with seating and quiet areas. They successfully applied for a grant from Millennium Commission ( a project supported by the National Lottery). The aim of the project was to introduce 250new areas of open space for the year 2000 to the benefit and enjoyment of the local community. The primary stipulation was that the space was to be designed, created and maintained by the community. Kent County Council subsequently passed the land to the Parish Council who in turn handed it to the Kilndown Millennium Green Trust for day to day management. With fundraising of £12,000and volunteers doing the groundwork the Green was formally opened by the Mayor of Tunbridge Wells on 17th June 2000. The trustees jointly manage both the Green and the Hall Trusts. Help us, the Trustees, to keep it clean, tidy, pruned, weeded and inviting to use for us in the village and for all those hiring the Hall. THE NEXT GARDENING ON THE GREEN WILL BE SATURDAY 10TH NOVEMBER WHEN THE PRINCIPAL JOB WILL BE CLEARING THE AUTIMN LEAVES. Option 2: You might find it difficult to commit to a specific time but may be happy to help at a time to suit you. If so you can help by adopting a task such as keeping the paved area weeded, hedges trimmed or a particular shrub / tree clipped. If so contact Sue Jackson (email suej.Jackson@btinternet.com or Tel: 01892 890090) to discuss. Please help as its hard work for a few but a lot easier for many. Lets make sure we can preserve the Green in top condition and leave a legacy fur future villagers. The Kilndown Film Club continues to host a monthly film on a Friday night at 7.30pm.Over the next few months we have some crackers coming up (all of which can be found on our calendar of events on the website). Trick or Donate - Halloween with a difference. This year the Kilndown Village Hall Committee would like to suggest an alternative Halloween for your little ones. Instead of Trick or Treating and asking for donations of chocolate and sweets we would like to encourage all children from the village to collect for donations for the Tunbridge Wells Foodbank. 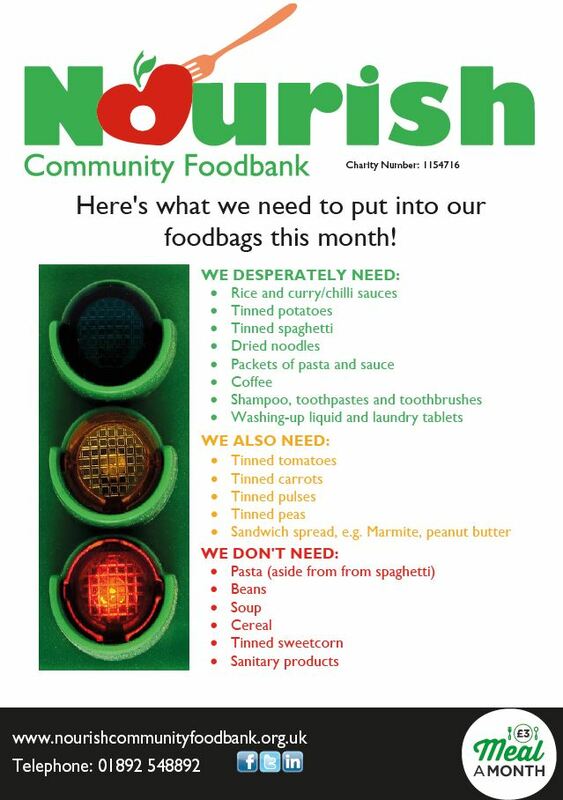 Nourish Community Foodbank provided 41,526 meals last year to Tunbridge Wells and surrounding areas and 46% of those were to children under 18 years old. These people need supporting due to benefit changes, unemployment, domestic abuse, having debt problems and as a result of having had an accident or being unwell. For more information on the charity or how you could support them please click here. On the 31st October we will be meeting in the Village Hall at 6pm to then walk around the village to collect your donations. If you are happy for the children to knock please display the leaflet which can be downloaded here or that will be posted through your Kilndown letterbox in October. If you prefer not to have anyone knock but would still like to donate, donations can be left at the Village Hall from 5pm or before the 31st at Blackberry Cottage, Rogers Rough Road, Kilndown. TN17 2RJ. The foodbank have asked in particular for the following items however any donation no matter how small of any food or toiletries would be gratefully received. 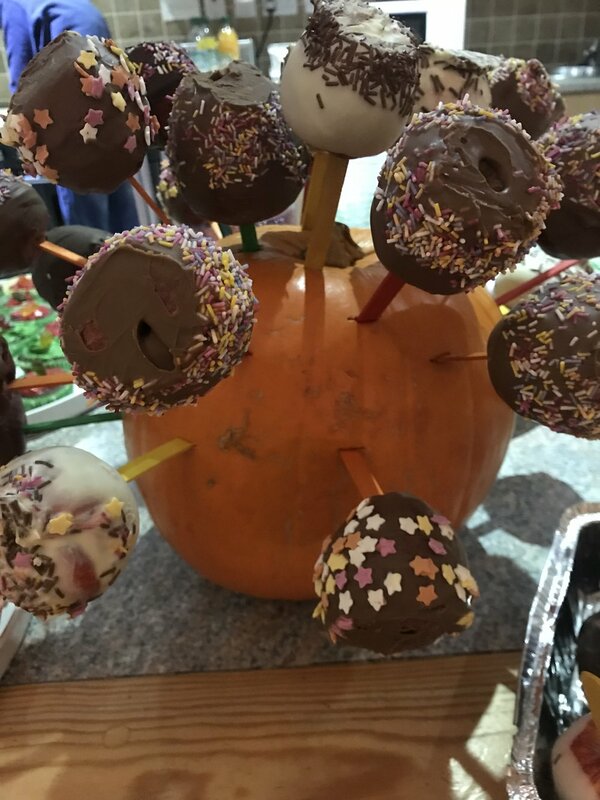 After the collection we will be hosting a little children's party in the Village Hall until 7.30pm so that the children still get a chance to have a sugar fix and see their friends all dressed up. If anyone has any questions or would like to volunteer to help with the party or donate a sugary cake or tasty treat please contact Laura-Louise White on 07790231183 or email on llblair_2000@yahoo.co.uk. Please support this initiative if you can to help those in our local communities who are struggling or need some temporary help. Hugh Jackman leads an all-star cast in this bold and original musical filled with infectious show-stopping performances that will bring you to your feet time and time again. Inspired by the story of P.T Barnum (Jackman), the film follows the visionary who rose from nothing to create a mesmerising spectacle. This inspirational film also stars Zac Effron, Michelle Williams, Rebecaa Ferguson and Zendaya. This will be held in the Village Hall, Friday 20th July. Doors open 7pm - Film starts at 7.30pm. A cover-up that spanned four U.S Presidents pushed the country's first female newspaper publisher and a hard-driving editor to join an unprecedented battle between the press and the government. This will be held in the Village Hall, Friday 22nd June. Doors open 7pm - Film starts at 7.30pm. Notice of AGM: 2nd May 2018 at 8pm in the Village Hall. Refreshments from 7.45pm. You are invited to the AGM of the Kilndown Village Trusts which will be held on the 2nd May during the Annual Village Meeting (Registered charity numbers: 288395 and 1078502). Kenneth Branagh plays Hercule Poirot in this star-studded retelling of Agatha Christie's classic whodunit. With Judi Dench, Johnny Depp, Penelope Cruz, Derek Jacobi and many more! This will be held in the Village Hall, Friday 27th April. Doors open 7pm - Film starts at 7.30pm. On 7th April 2017 they launched a new service bringing a library of information and a mobile café to rural communities in Kent and Medway. Interested? Come and get together with old friends and new. Have a cuppa and a delicious slice of cake in the Village Hall Car Park. They'll have all sorts of local information available or you can just come for a chat. All dates will be 10am-12pm. We will post more news nearer the time on this website and on Facebook. We need a good local handyman to take on small Village Hall /Green jobs and repairs when they arise. If you could do this, or know someone who could, please contact Tracy Roberts on 01892891122.